A series of cold fronts produced moderate falls across southern Australia, with heavy rain along the west coast at the end of the week. Showers associated with a coastal trough generated moderate fall along the east coast of New South Wales. Past seven days: At the start of the week, a cold front and a complex area of low pressure tracked across southeastern Australia and eastern New South Wales, generating moderate falls. Another cold front and low pressure system followed, passing over southern Victoria and Tasmania, and produced moderate falls over southern central Victoria, and western Tasmania. Onshore showers affected the north tropical coast of Queensland. Around the middle of the week, a thick cloudband developed over southwest Western Australia associated with a cold front tracking across southwest and southern Western Australia. Moderate falls were recorded in the South West Land Division, and southeast Western Australia. Middle to high level cloud ahead of this system resulted from an upper-level disturbance, with thunderstorms also occurring through the interior of Western Australia. In the east, a southerly airstream associated with a complex low pressure system over the Tasman Sea brought showers and moderate falls from the central coast of New South Wales to far eastern Victoria for the remainder of the week. At the end of the week, a surface trough and strong cold front approached the west coast of Western Australia and produced a middle- to high-level cloudband, with embedded thunderstorms developing over the southern half of Western Australia. A strengthening northerly flow ahead of the cold front produced moderate to locally heavy falls about the northwest coast and adjacent inland areas, while lighter falls were also recorded along the southwest coast of Western Australia. 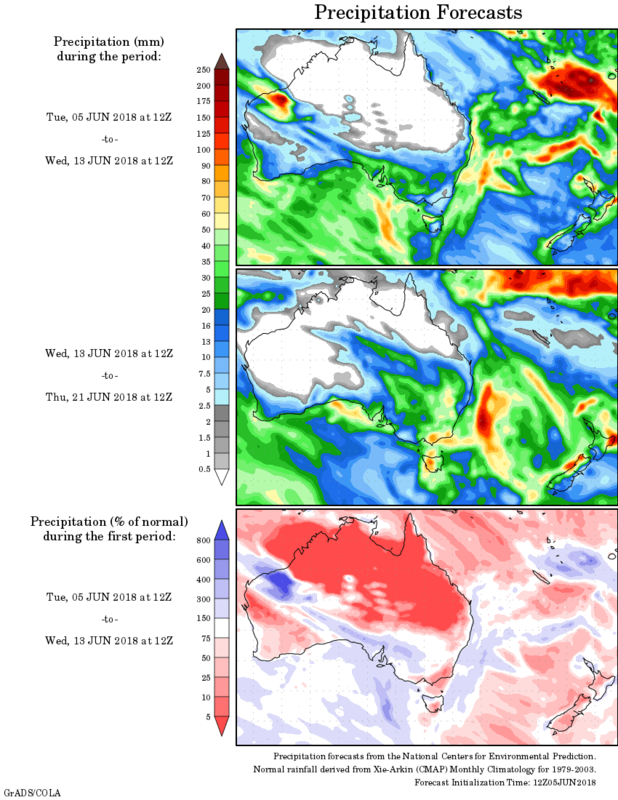 Rainfall totals in excess of 100 mm were recorded along the exposed Gascoyne coast near Shark Bay, and about the central coast of New South Wales, including the highest weekly total of 201 mm at Nelson Bay (Nelson Head) in the Hunter District. Rainfall totals between 50 mm and 100 mm were recorded surrounding higher falls along the exposed Gascoyne coast and on the central coast of New South Wales. Totals in excess of 50 mm were also recorded at locations in the far southwest of Western Australia, far East Gipplsand in Victoria, and in parts of elevated western Tasmania. Rainfall totals between 10 mm and 50 mm were recorded from the Gascoyne to western Pilbara, and the southwest and southeast of Western Australia; southeast South Australia; parts of southern, central and eastern Victoria; northern and western Tasmania; parts of eastern New South Wales and small areas of the north tropical Queensland coast. Little or no rainfall was recorded in northern and inland Western Australia and the South Coastal District; the Northern Territory; most of South Australia away from the southeast; northwestern Victoria; western and northern New South Wales; and most of Queensland except for isolated pockets of the east coast.